Just a 10-minute walk from the sandy shores and turquoise waters is the modern, luxurious Bone Club Sunset Hotel & Spa. The Side town centre is only a 20 minutes’ drive from the hotel, which means you are not too far away from city life. 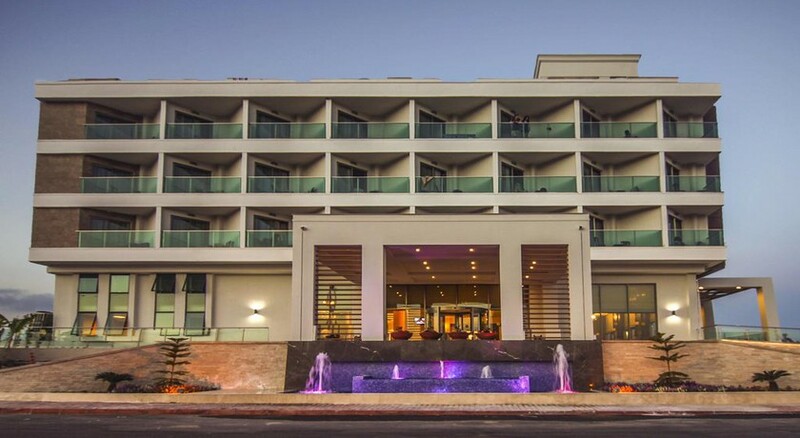 The hotel features spacious, well-furnished guest rooms decked out in contemporary style. 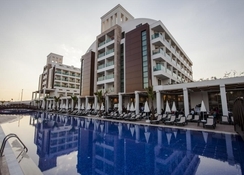 The on-site restaurants offer Turkish and international cuisines in buffet and a la carte styles. You can also enjoy drinks and snacks throughout the day at the hotel’s six bars. 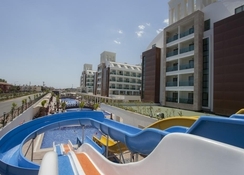 With 4 outdoor pools and water slides, there are plenty of opportunities for water-fun. The hotel also has a private area at the beach with free sun loungers and parasols. 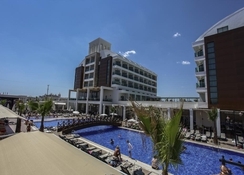 Holidaymakers looking for complete relaxation can visit the spa that offers rejuvenating massages, Turkish bath and a sauna, while kids will be delighted with the children’s playground, water slides, paddling pools and mini club. Whether you’re coming for a weekend break or a longer stay, Bone Club Sunset Hotel & Spa ensures a welcoming stay. Bone Club Sunset Hotel & Spa enjoys a convenient beachfront location and is located 550 metres away from the azure waters, which means you’re just 10 minutes’ walk away from the beach. the town centre of Side dotted with shops, bars and restaurants is a 20-minute drive (12 km) from the hotel. 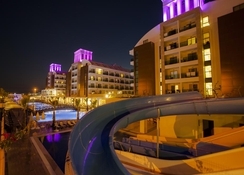 The nearest airport to the hotel is the Antalya Airport that’s 55 km away. 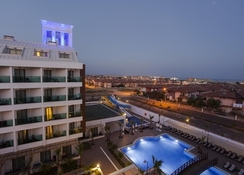 A total of 270 modern and cheery rooms spread across two floors are up for the guests at this all-inclusive hotel. The comfortable, well-designed guest rooms are furnished with modern facilities. There are two sets of rooms, all of which come fitted with the same amenities except for the difference in room sizes. Bone Club Sunset Hotel & Spa consists of 197 Standard Rooms that can sleep up to four people, and each come with a balcony. The Family Rooms are more spacious, and sport two separate bedrooms along with balcony. They are suitable for larger families of up to five members. The hotel also offers specially designed rooms suitable for travellers with physical disabilities. Basic room amenities include air conditioning, telephone, TV with satellite connection, housekeeping, mini bar, private bathroom with shower, hairdryer and toiletries. Featuring both indoor and alfresco seating, the restaurants at Bone Club Sunset Hotel & Spa serve buffet and a la carte breakfast, lunch and dinner. Guests can choose from a range of Turkish and international delicacies, and even get it cooked in front of them. Whether you opt for indoor dining or enjoy your meal overlooking the pool, you’ll get a variety of culinary options to treat your palate. Children between the age of 4 and 12 years are offered a specially designed kids’ buffet featuring dishes of their preference. The hotel also has couple of bars that serves cocktails and mocktails, as well as other alcoholic drinks and beverages. The poolside bar serves beverages and snacks throughout the day. The beach bar allows guests to sink their toes into the soft sand while enjoying their favourite drinks. There is a shuttle bus to the beach from the hotel every 30 minutes, and the bus is stocked with snacks and beverages. You can also choose to take a stroll to the beach, which takes around 10 minutes on foot. The hotel has three swimming pools for adults, fitted with beach loungers and parasols. There’s also a kids’ pool with water slides. The young guests can also enjoy at the mini club and the hotel’s animation team organises different programmes and fun activities for children. The on-site spa and wellness centre provides complete rejuvenation of the body and mind with a wide range of massage therapies, hammam, Turkish bath and sauna. Sports lovers can enjoy beach volleyball, water games outdoors as well as various indoor games like table tennis and billiards. There’s also a fully equipped gym if you wish to stay in shape on your holidays. Evening entertainment in the hotel includes a disco bar where you can dance the night away. I was very apprehensive about staying at the Bone Club after reading reviews on Trip Advisor, I even considered cancelling my booking. It was however a great choice for a very cheap, two week stay in the sunshine. Yes, the food is repetitive but you will never go hungry, the Turkish night on a Saturday was fantastic. The resort also caters more for Russian/German visitors, this was absolutely fine with me but I’m sure others will be put off by the lack of ‘Britishness’. There is excellent transport links to near by towns for day trips, I would recommend taking the bus to Side for the morning. We arrived late on the Saturday evening, just missing out on the midnight food offered. The reception staff ordered us a takeaway and bought it to our room! Outstanding customer service. Please don’t be put off by Trip Advisor! I can only assume other guests expected a lot more for the price they paid for their stay.